So there I was, minding my business at the local HEB (that’s a big Texas supermarket chain for you folks up North) when I saw this in the canned meat isle. 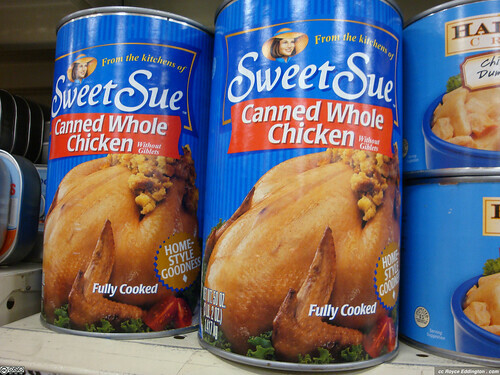 Sweet Sue’s Canned Whole Chicken. This entry was posted in Photos by admin (Royce). Bookmark the permalink. I just need to know: is it boneless & skinless? It’s not boneless or skinless because it is the whole chicken with broth. My mother used to buy these when I was a kid and all of us children loved it. It is really great for a quick meal and especially good served as chicken noodle soup.